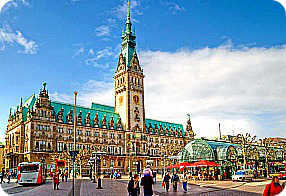 Book now the best shore excursions in Hamburg. High quality and safety at the lowest prices. If your are looking for Shore Excursion Hamburg, book now the best guided tours at lowest price with Ancora Tours. Since 2003 we offer you official guides in english, transportation and travel insurance, all included. The highest quality at the lowest rates. As the second largest port in Europe, Hamburg is an affluent city; a hub for both industry and leisure. The city has many stories to tell and anecdotes to reveal, making it an excellent destination for a shore excursion. What’s eating: Fischbrötchen: a crusty bread roll filled with fish (most commonly herring,) onion and pickle. Souvenir: Beatles items can be found all throughout the city. Hamburg is known as the ‘gateway to the world’ and during our shore excursion we’ll visit the most important monuments this worldly city has to offer. Our sightseeing tour of the city of Hamburg will start from its very centre on the shore of the Alster Lake. The lake, situated in the green heart of the city, represents a real paradise for those residents who love water soft sports (canoa, sailing boat, ecc…). We will then pass by the residential districts and the Jungfernstieg, the famous fashionable street scattered with luxury boutiques and shopping centres. Afterwards we will have the chance to admire the Renaissance buildings housing, the Town Hall and the Stock Exchange before entering the more modern part of the city with its parks and gardens and much more. We will have an external visit of St. Michael’s Church– the city’s main protestant church and one of the most important architectural constructions in Germany. The Baroque spire of St. Michael’s Church is a focal point of the Hamburg skyline. 132-metres high, it is a landmark for ships sailing up the River Elbe. At the entrance, a large copper statue depicts St. Michael standing fiercely victorious over the Devil. The next and last stop of our tour before coming back to the port is the Krameramtsstuben, a complex consisting of five buildings built between 1620 and 1676 by the merchants’ association to house merchants’ widows. It has been very well preserved so it gives us a general idea of what life was like at the beguinning of the 17th century. We’ll then drive back to port for boarding.